More and more people are getting tired of being inside four walls and want to enjoy the open air whenever they can. This desire has led to a massive change in landscape design and concepts because people now install outdoor kitchens, dining rooms, and even entertainment systems outdoors. 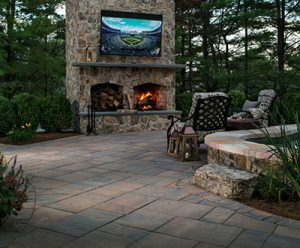 If you love to host parties or want to watch TV shows, movies, or football games while you relax on your patio, you need a good outdoor entertainment system. We at Ivy Studio can help with that. Modern technology has evolved enough to withstand rough outdoor conditions and we’ve installed outdoor TV and audio systems much to the joy of our clients. Our first priority is to understand your requirements for a backyard entertainment system. We’ll ask you a set of questions like whether you want just audio or both audio and video. We’ll also discuss your budget because most outdoor-safe devices are more expensive than normal TVs and speakers. Our next step is to assess the property and figure out the right placement for all products. We want to make sure that you get the best experience from your outdoor entertainment set-up so we plan the location of the patio speakers, the number of speakers, and the location of the television carefully. For that, we need to understand your property, the design, lighting, and viewing angles. Once we have a proper plan in place, we look at the products you want to install. We have considerable experience in this field and are familiar with the most popular and efficient products in the market. We will choose the best outdoor electronic products for you and make sure they’re installed correctly. It’s important to invest in good quality products at the beginning because poor quality devices would need to be replaced regularly. While there are many wireless and Bluetooth speakers available today, they don’t have enough range or weather resistance to be permanently installed in your backyard. Good outdoor audio systems are often wired and they deliver superior audio clarity and quality. TVs require wiring for power and programming though you can use Apple TV, ChromeCast, and other streaming products to reduce the number of wires. Our experts will install an efficient outdoor entertainment system to add to your modern landscaping and make sure it can stand up to the harsh outdoor conditions. Ivy Studio are the modern landscaping design experts that provide comprehensive landscaping solutions to the greater Boston and Massachusetts Bay area. Get started on your landscape design project today to discuss outdoor entertainment systems or take a look at the other landscape design services we offer.